Scientific analysis of 8,000-year-old pottery jars unearthed in Georgia offers the world's earliest evidence of grape wine-making, dating the tradition almost 1,000 years earlier than previously thought, researchers said Monday. Before, the oldest known chemical evidence of wine in the Near East dated to 5,400-5,000 BC (about 7,000 years ago) and was from the Zagros Mountains of Iran, said the report in the Proceedings of the National Academy of Sciences, a peer-reviewed US journal. Scientists on the team came from the United States, Canada, Denmark, France, Italy, Israel and Georgia. They have been working for the past four years to re-analyze archeological sites that were found decades ago. 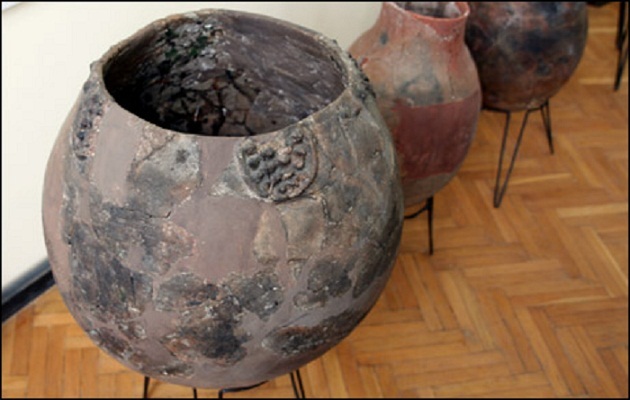 The fragments of ceramic casks, some decorated with grape motifs, were found at two archeological sites called Gadachrili Gora and Shulaveris Gora, about 30 miles (50 kilometers) south of the Georgian capital Tbilisi. Scientists used new methods to analyze the residue preserved inside -- specifically, an exacting chemical technique known as tandem liquid chromatography-mass spectrometry-mass spectrometry, or LC-MS-MS. Researchers also found three associated organic acids -- malic, succinic and citric -- in the residue from the eight jars. During this era, people began farming, domesticating animals, making polished stone tools, crafts and weaving, researchers said. "The domestication of the grape apparently led eventually led to the emergence of a wine culture in the region," said Batiuk. "The Taurus Mountains of eastern Turkey are also a prime candidate for further exploration with its monumental sites at Gobekli Tepe and Nevali Cori at the headwaters of the Tigris River, dating as far back as 9,500 BCE."